The Naoki prize-winning author Kazufumi Shiraishi wearing traditional attire, chan-chanko, at his kanreki 60th birthday event. Photo: Red Circle Authors. 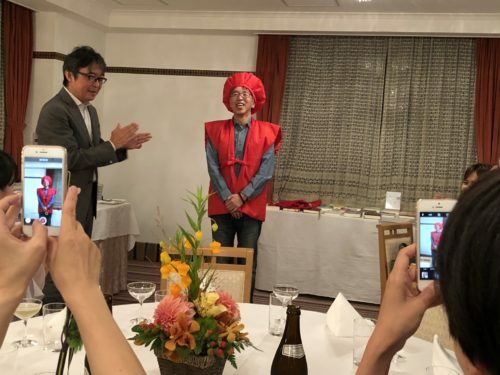 In October two major Japanese publishers, Tokuma Shoten and Kadokawa, held a 60th birthday party for the Red Circle author Kazufumi Shiraishi. In Japan 60th birthdays are a major milestone known as kanreki. At 60th birthday celebrations it is traditional to wear a red vest and hat known as chan-chanko since red is said to offer protection. And this is something that Shiraishi did this month before a larger number of editors, authors and friends. A video with highlights from Shiraishi’s life and career was shown; covering events from his childhood to his winning of the 142nd Naoki Prize, one of Japan’s most prestigious literary awards, in 2010. Messages of congratulation were shared from both international publishers and Japanese publishers who have published his works. 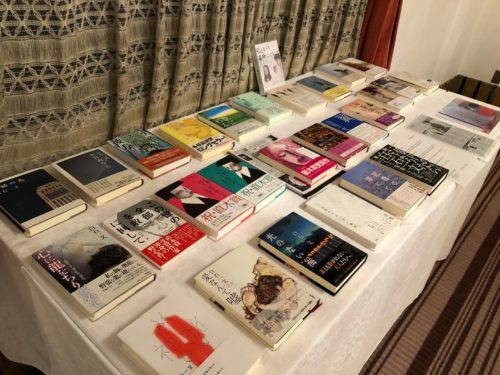 Display of books by Kazufumi Shiraishi at his 60th birthday event. Photo: Red Circle Authors Limited. And several speeches were also made by friends and authors including another award-winning author Misumi Kubo – who is best known for her short story, Mikumari, about an affair between a schoolboy and a married woman, ten years older, who share an unusual hobby, cosplay. 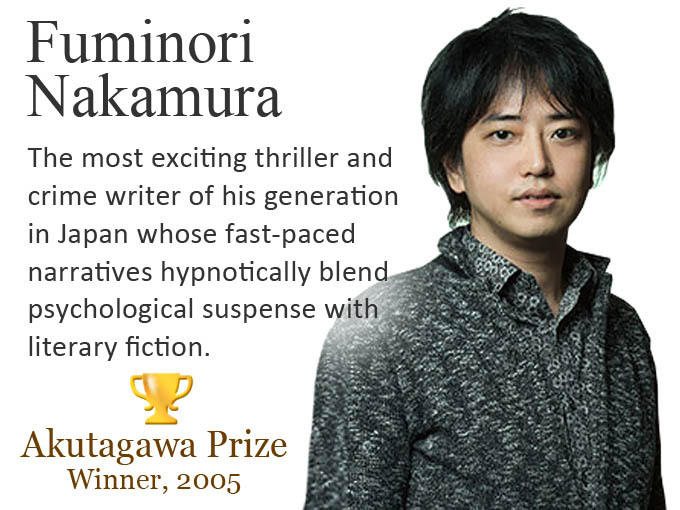 The event coincided with the publication of Shiraishi’s latest novel 100 Million Yen Sayonara, which is receiving excellent feedback from readers and reviews. One reader commented on Twitter that it was the first book by the author he had read and he was grateful, as it had reminded him that reading novels could be so much fun. Another commented that her neighbour had told her that it had been a long time since she had read a novel, and on top of that one that moved her so much, so she decided to buy a copy. Below is a list of some of the many reviews in the Japanese media of Shiraishi’s latest book 100 Million Yen Sayonara.